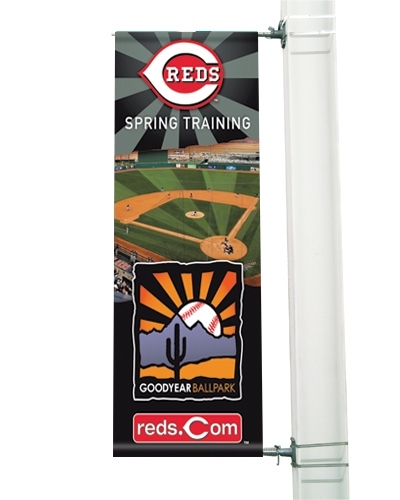 2'x4' two-sided pole banners with pole pockets top and bottom. Banners are custom made from heavy duty fire retardant 13 oz "scrim" matte vinyl. They are printed full color digital with outdoor UV solvent inks that are warranted against fading for three years. Sewn hems on all four sides and standard grommets are included. They are perfect for use w/ photos and logos for school banners, event banners, outdoor banners, avenue banners, street banners, and sports banners. Price includes: Full color on two sides. Imprint detail: 2'' x 4''. Comment: Please Call For Quote on Larger Quantities.